Maxime Lacroix - who was Sheffield Steelers leading scorer in the 2013-4 season until he suffered twin fractures to his ankle - wants to return to the club. The 27-year-old French Canadian’s agent has made contact with the club, which has a slot to fill on its forward line.Coach Paul Thompson is aware of the razor sharp skills Lacroix displayed in his early weeks with the club before the three month lay-off. But he is examining other options and is in no rush to commit. Lacrois played for Rouen in France last year, averaging more than a point per game in the League, and is being courted in that country by Angers. He said his aim was to help the team win all three trophies and that playing in the European Champions League, which would be an opportunity for the squad to bond early on in the 2015-16 campaign. 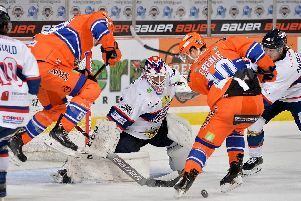 n Sheffield Arena will host the Challenge Cup final on March 6, next year. Who is your top pick from Sheffield Steelers’ “disappointing” import category in 2018-19?